This is my first book by Lauren Oliver, although her other works have been on my radar for quite some time. My first impression is that I like the writing style, particularly her metaphors, and her characters are certainly interesting, flawed and unique, and overall the story was gripping and entertaining. In this instance, however, although I enjoyed the story, I almost want to mark it down a star just to show my staunch disapproval of it. I'm just not sure it's a good idea to fictionalise something so dangerous, or to imply it somehow made Heather realise her potential, or made her a better, braver person for the rest of her life. When what it really was was reckless, stupid and pointless. What am I talking about? Well "PANIC" is the name of a game that seniors in the town of Carp begin each year the day after graduation. It starts with players announcing their intent to participate by jumping of a cliff into freezing water. Thereafter, each remaining player is challenged to further, more dangerous tests, and the goal is to not panic, to hide your fear, to be the fastest, the bravest (the deadest), until only two remain who then participate in Joust (playing chicken in cars - AWESOME! *Double thumbs up*). At first, the tests didn't seem too bad - walking across a plank between two water towers. Although still dangerous and with the potential of falling to your death, it was at least a "test" of your fear of heights, etc. Later, though, the challenges became less of a test, and more pot luck - Russian Roulette with a loaded weapon to the temple... I mean, what? I think I best move on now because although I clearly found lots to get annoyed about with PANIC, there was a lot to enjoy as well. And that was mostly all down to the characterisation. The book is told in alternating third person between Heather and Dodge. The other two main characters in their little foursome, Nat and Bishop, didn't narrate, which I thought was odd, actually, since Heather and Dodge were not each other's romantic interest. What they both were, however, were complex, somewhat troubled individuals, each with a fascinating story to tell. Heather's home life was hectic and unhealthy, and she had self esteem issues surrounding her height - feeling big and bulky around all the tiny, dainty girls. Dodge, on the other hand, was a rather messed up young man with nothing but revenge on his mind. You might be wondering about the romance, then, since I said Heather and Dodge were not each other's boo? Well, in many respects, I think it would be truthful to say there was no romance in panic. There was a love interest for each narrator, sure, but no romance scenes in the way I'm used to reading them. No time was dedicated to pursuing that line of inquiry - It all went on in the periphery. 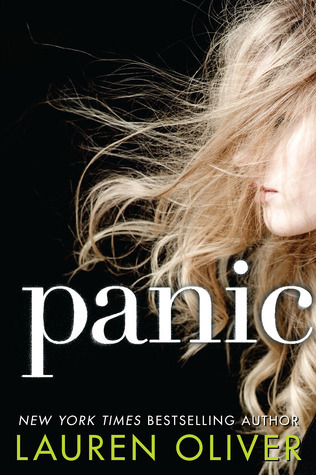 I think it's safe to conclude that I'm conflicted in my overall feelings about PANIC. Some of it was great reading, and other parts of it, although still entertaining, made me stark raving mad. Which is how I've ended up settling on a rather wish-washy, largely unhelpful rating of 3.5 stars. I would say, though, that if you're already a fan of this author's style, you will probably enjoy it because I could see that shining through even the murky, icky stuff I didn't like, and it only made me more curious about her other books. Hmmmm. I've seen this one on a lot of blogs recently. I haven't read a Lauren Oliver book yet but I think that if I remember it's fiction I'd enjoy the book. I get where you're coming from though because this is aimed at young readers who most of the time don't need to be any more encouraged to act recklessly.